Nearly half a century later, such insights appear prescient, in the wake of the rise of Brazil, Russia, India, China and South Africa (BRICS) as an active alliance. By 2013 these five key nations encircling the traditional Triad (the US, European Union and Japan) were decisive collaborators with imperialism. They advanced the cause of neoliberalism by reaffirming its global institutional power structures and driving over-productive and over-consumptive maldevelopment, and they colluded in destruction of not just the world environment – through prolific contributions to climate change – but in the sabotage of any potentially workable global-scale ecological regulation (favouring instead deepened commodification through emissions trading). Much of the long-standing (apartheid-era) critique of South African sub-imperialism still applies, but what is new is that thanks to financial deregulation associated with the country’s “elite transition” from racial to class apartheid during the 1990s, what were formerly Johannesburg and Cape Town-based regional corporate powers – Anglo American Corporation, DeBeers, Gencor (later BHP Billiton), Old Mutual and Liberty Life insurance, SA Breweries (later merged with Miller), Investec bank, Didata IT, Mondi paper, etc. – escaped. These firms’ financial headquarters are now in London, New York and Melbourne, and the outflows of profits, dividends and interest are the main reason South Africa was ranked the “riskiest” among 17 emerging markets by The Economist in early 2009, requiring vast new foreign debt obligations to cover the hard currency required to facilitate the vast capital flight. South Africa cannot, thus, be described as “imperialist” – it is simply retaining far little of the surplus. Aside from lubricating world neoliberalism, hastening world eco-destruction, and serving as coordinator of hinterland looting, what are the other features of sub-imperialism that must be assessed, in a context of Washington’s ongoing hegemony? If a “new imperialism” entails – as the City University of New York’s renowned Marxist scholar David Harvey suggests – much greater recourse to “accumulation by dispossession” and hence the appropriation of “non-capitalist” aspects of life and environment by capitalism, then South Africa and the other BRICS offer some of the most extreme sites of new sub-imperialism in the world today. The older generation of arguments about South Africa’s “articulations of modes of production” – i.e., migrant male workers from Bantustans providing “cheap labour” thanks to black rural women’s unpaid reproduction of children, sick workers and retirees generally without state support – seems to apply even more these days, when it comes to notorious Chinese pass-laws or the expansion of the South African migrancy model much deeper into the region in the wake of apartheid (notwithstanding tragic xenophobic reactions from the local working class). First, to make the case that sub-imperialism lubricates global neoliberalism in these various ways, and that within BRICS South Africa joins the other “deputy sheriffs” to keep regional law and order (e.g. in the Central African Republic, at the time of writing in early 2013), requires dispensing with naïve accounts of foreign policy that remain popular in the international relations field. Some scholars argue that South Africa’s role is neither anti-imperialist nor sub-imperialist – that as a “middle power”, Pretoria attempts to constructively “lead” Africa while acting in the continent’s interests (Maxi Schoeman), through “building strategic partnerships … in a constant effort to win over the confidence of fellow African states, and to convince the world community of its regional power status” (Chris Landsberg), thus seeking “non-hegemonic cooperation” with other African countries (John Daniel et al.). But these thinkers are missing an opportunity to interrogate the power relations with the critical sensibility that these times demand, not least because super-exploitative extractive industries based upon migrant labour, without regard to community degradation and ecological damage (e.g. the well-known Marikana platinum mine so profitable to Lonmin until 2012), continue to be the primary form of BRICS countries’ engagement with Africa. Occasionally this agenda leads directly to war, a fetish about which is also a common distraction among scholars attempting to elucidate imperial-subimperial power relations. In the recent era, the main military conflicts associated with Washington-centred imperialism have been in the Middle East, Central Asia and North Africa, and so Israel, Turkey and Saudi Arabia are often cited as the West’s sub-imperial allies. But it was not long ago – from the 1960s through late 1980s – that Southern Africa was the site of numerous wars featuring anti-colonial liberation struggles and Cold War rivalries, with apartheid South Africa a strong and comforting deputy to Washington. Over two subsequent decades in this region, however, we have witnessed mainly state-civil tensions associated with conflict-resource battles (e.g. in the Great Lakes region where southern Africa meets central Africa and where millions have been killed by minerals-oriented warlords), neoliberalism (e.g. South Africa and Zambia), an occasional coup (e.g. Madagascar), dictatorial rule (e.g. Zimbabwe, Swaziland and Malawi) or in many cases, a combination. The civil wars engineered by apartheid and the CIA in Mozambique and Angola had ceased by 1991 and 2001, respectively, with millions dead but with both Lusophone countries subsequently recording high GDP growth rates albeit with extreme inequality. Across Southern Africa, because imperial and sub-imperial interests have both mainly focused upon resource extraction, a variety of cross-fertilising intra-corporate relationships emerged, symbolised by the way Lonmin (formerly Lonrho, named by British Prime Minister Edward Heath as the “unacceptable face of capitalism” in 1973) “benefited” in mid-2012 from leading ANC politician Cyril Ramphosa’s substantial shareholding and connections to Pretoria’s security apparatus, when strike breaking was deemed necessary at the Marikana platinum mine. South African, US, European, Australian and Canadian firms have been joined by major firms from China, India and Brazil in the region. Their work has mainly built upon colonial infrastructural foundations – road, rail, pipeline and port expansion – for the sake of minerals, petroleum and gas extraction. BRICS appears entirely consistent with facilitating this activity, especially through the proposed BRICS Bank. Might this conflict of interests result in armed conflict as a result of Washington’s more coercive role in this continent? The Pentagon’s Africa Command (Africom) has prepared for an increasing presence across the Sahel (e.g. Mali at the time of writing) out to the Horn of Africa (the US has a substantial base in Djibouti), in order to attack al Qaeda affiliates and assure future oil flows and a grip on other resources. 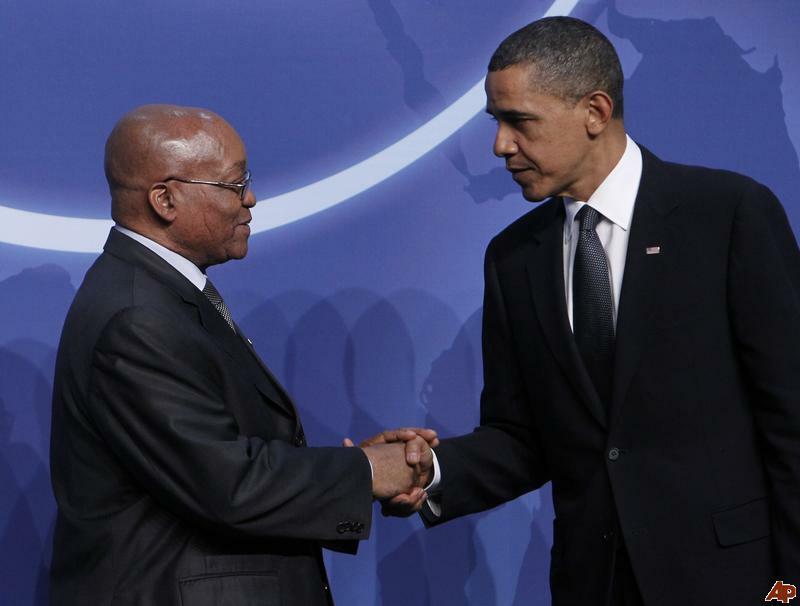 Since taking office in 2009, US President Barack Obama has maintained tight alliances with tyrannical African elites, contradicting his own talk-left pro-democracy rhetoric within a well-received 2009 speech in Ghana. According to Sherwood Ross, one reason is that among 28 countries “that held prisoners in behalf of the US based on published data”, are a dozen from Africa: Algeria, Djibouti, Egypt, Ethiopia, Gambia, Kenya, Libya, Mauritania, Morocco, Somalia, South Africa and Zambia. In Gambia, for example, President Yahya Jammeh’s acquiescence to the CIA’s need for a rendition site for US torture victims may explain Obama’s blind eye towards his dictatorship. Likewise, the US role in Egypt – another rendition-torture hotspot – in propping up the Mubarak regime until the final days spoke volumes about the persistence of strong-man geopolitics, trumping the “strong institutions” that Obama had promised. With fewer direct military conflicts in Africa but more subtle forms of imperial control, and with “Africa Rising” rhetoric abundant since the early 2000’s commodity price boom, the continent and specifically the Southern African region appear as attractive sites for investment, in no small measure because of South Africa’s “gateway” function, with Johannesburg as a regional branch-plant base for a variety of multinational corporations. Likewise, the US Air University’s Strategic Studies Quarterly cited a US military advisor to the African Union: “We don’t want to see our guys going in and getting whacked… We want Africans to go in.” In late 2006, for example, when Bush wanted to invade Somalia to rid the country of its nascent Islamic Courts government, he called in South African President Thabo Mbeki to assist with legitimating the idea, though it was ultimately carried out by Meles Zenawi’s Ethiopian army three weeks later. When in 2011, Obama wanted to invade Libya to rid the country of Muammar Gaddafi, South Africa voted affirmatively for NATO bombing within the UN Security Council (where it held a temporary seat), in spite of enormous opposition within the African Union. And in January 2013, Pretoria deployed 400 troops to the Central African Republic during a coup attempt because, “We have assets there that need protection”, according to deputy foreign minister Ebrahim Ebrahim, referring to minerals (according to his interviewer) or to sophisticated weaponry that South Africa gifted the tyrant ruler there, Françoisozizé (according to his reply in a debate with me in late February). For foreign policy, the big question raised by Zuma’s presidency was whether the momentum from Mbeki’s expansionist “New Partnership for Africa’s Development” (Nepad) would be resumed after that project’s demise, given the former’s preoccupations with domestic matters and comparatively weak passion for the international stage. Only in 2012 was the answer decisively affirmative: Nkozana Dlamini-Zuma’s engineered election as African Union Commission chairperson. By mid-2012, Pretoria’s National Development Plan – overseen from within the South African presidency and endorsed at the ANC’s December 2012 national conference – provided a variety of mandated changes in policy so as to align with South Africa’s new BRICS identity and functions. These mainly involved pro-business statements for deeper regional economic penetration, alongside the exhortation to change “the perception of the country as a regional bully, and that South African policy makers tend to have a weak grasp of African geopolitics”. That problem will haunt Pretoria in coming years, because like the political carving of African in Berlin in 1884-85, the BRICS 2013 Durban summit has as its aim the continent’s economic carve-up, unburdened – now as then – by what would be derided as “Western” concerns about democracy and human rights. Also invited were 16 African heads of state to serve as collaborators. confirm the financing of both African land grabbing and the extension of neo-colonial infrastructure through a new BRICS Bank, in spite of the damaging role of the Development Bank of Southern Africa in its immediate hinterland, following Washington’s script. With this evidence, and more, can we determine whether the BRICS are “anti-imperialist” – or instead, “sub-imperialist”, doing deputy-sheriff duty for global corporations and neoliberal ideologues, while controlling their own angry populaces as well as their hinterlands through a more formidable security apparatus? The eco-destructive, consumerist-centric, over-financialised, climate-frying maldevelopment model throughout the BRICS works very well for corporate and parastatal profits, especially for Western capital, but is generating repeated crises for the majority of its people and for the planet. “Doesn’t the Brazilian expansionist policy in Latin America and Africa correspond, beyond the quest for new markets, to an attempt to gain control over sources of raw materials – such as ores and gas in Bolivia, oil in Ecuador and in the former Portuguese colonies of Africa, the hydroelectric potential in Paraguay – and, more cogently still, to prevent potential competitors such as Argentina from having access to such resources? “Doesn’t the export of Brazilian capital, mainly via the state as exemplified by Petrobras, stand out as a particular case of capital export in the context of what a dependent country like Brazil is able to do? Brazil also exports capital through the constant increase of foreign public loans and through capital associated to finance groups which operate in Paraguay, Bolivia and the former Portuguese colonies in Africa, to mention just a few instances. Matters subsequently degenerated on all fronts. In addition to these criteria – regional economic extraction, “export of capital” (always associated with subsequent imperialist politics) and internal corporate monopolisation and financialisation – there are two additional roles for BRICS regimes if they are genuinely sub-imperialist. One is ensuring regional geopolitical “stability”: for example, Brasilia’s hated army in Haiti and Pretoria’s deal-making in African hotspots like South Sudan, the Great Lakes and the Central African Republic for which $5 billion in corruption-riddled arms purchases serve as military back-up. the more that specific companies targeted by victims require unified campaigning and boycotts to generate solidaristic counter-pressure, whether Brazil’s Vale and Petrobras, or South Africa’s Anglo or BHP Billiton (albeit with London and Melbourne headquarters), or India’s Tata or Arcelor-Mittal, or Chinese state-owned firms and Russian energy corporations.
. J Zuma, “ANC January 8th statement 2013”, speech to the African National Congress, Durban, January 12, 2013.
. J Zuma, “South Africa is open for business”, speech to the World Economic Forum, Davos, January 23, 2013.
. RM Marini, “Brazilian interdependence and imperialist integration”, Monthly Review, 17, 7, 1965, p. 22. Two preliminary debates can be joined. First, recommending Marini’s ideas to fellow South Africans, Melanie Samson offers a valid critique of earlier analysis: “Although Bond is clear as to who benefits from sub-imperialism, he does not explicitly elaborate a theorisation of sub-imperialism. As an aside he asserts that, in the earlier imperial period analysed by classical theorists, imperial capacity was ‘reproduced through sub-imperial processes’. He also notes continuities in South Africa’s sub-imperial project in the Democratic Republic of Congo in the apartheid and post-apartheid eras. Despite his careful elaboration of the changing nature of imperialism, Bond presents an ahistorical, unchanging conceptualisation of sub-imperialism.” (M Samson, “(Sub)imperial South Africa? Reframing the debate”, Review of African Political Economy, 36,119, 2009, p.96.) The rise of BRICS offers an opportunity to correct this conceptualisation, although I hold to the standard argument that imperialism in Africa is largely exercised through the looting of resources and the application of neoliberal socio-economic policies, with South Africa mainly lubricating that process; for an earlier version, see P Bond, Looting Africa, London, Zed Books, 2006. Second, “While Pretoria might at times be justifiably accused of sub-imperialism and arrogance”, writes Ian Taylor, “the incomplete form of capitalism in much of southern Africa militates against a too easy application of the concept of sub-imperialism within the region… liberal regionalism and South African foreign policy are unlikely to enjoy an easy ride if and when they confront the non-hegemonic state and its ruling classes across the subcontinent.” I am not convinced, because sub-imperialism follows not only from Marini’s definition, but from worsening “combined and uneven development” which incorporates and amplifies “incomplete” capitalism (via “accumulation by dispossession”). Moreover, those advocating neoliberalism in the region did indeed enjoy an easy ride, to the extent widespread imposition of structural adjustment programs was accomplished hand-in-glove with local ruling classes. See I Taylor, “South African ‘imperialism’ in a region lacking regionalism”, Third World Quarterly, 32, 7, 2011, pp.1233-1253.
. O Stuenkel, “Can the Brics Co-operate in the G-20? A View from Brazil”, South African Institute for International Affairs, Occasional Paper 123, Johannesburg, December 2012.
. D Harvey, The New Imperialism, Oxford, Oxford University Press, 2003.
. M Schoeman, “South Africa as an emerging Middle Power, 1994-2003”, in J Daniel, A Habib and R Southall (Eds), State of the Nation: South Africa 2003-04, Pretoria, HSRC, 2003.
. C Landsberg, “South Africa’s global strategy and status”, Johannesburg, Friedrich Ebert Stiftung New powers for global change? Briefing Paper, February 2006, http://www.fes-globalization.org/projects/new_powers.htm.
. J Daniel, V Naidoo and S Naidu, “The South Africans have arrived: Post-Apartheid corporate expansion into Africa”, in J Daniel, A Habib and R Southall (Eds), State of the Nation: South Africa 2003-04, Pretoria, HSRC, 2003.
detention and torture of ‘suspects’”, Global Research, 1 April, 2010, http://www.globalresearch.ca/index.php?context=va&aid=18419.
. P Bond, “Who will get ‘whacked’ next in Africa?”, Links International Journal of Socialist Renewal, September 30, 2012, http://links.org.au/node/3043.
. S Cochran, “Security assistance, surrogate armies, and the pursuit of US interests in Sub-Saharan Africa”, Strategic Studies Quarterly, Spring 2010, 4, 1, http://www.au.af.mil/au/ssq/2010/spring/cochran.pdf.
. White House Press Office, “Press release: Remarks by President Bush and President Mbeki of South Africa in photo opportunity”, Washington, December 8, 2006. Specifically, Mbeki referred to: “the difficult situation in Somalia” – (“Yes, sir”, Bush intervened) and Mbeki continued, “and the President, together, we are very keen that, indeed, something must move there. This was a failed state. It’s necessary to support the transitional government, to restoring a government and to reunify the country, and so on. It’s an important thing because the problem, one of the big problems is that as it is, it provides a base for terrorists, find safe haven there and then can spread out to the rest of the continent. It’s something that is of shared concern.” Within three weeks, at Washington’s behest, Ethiopia invaded Somalia. (See Sudan Tribune, December 10, 2010, reporting on WikiLeaks cables: http://www.sudantribune.com/US-behind-Ethiopia-invasion-in,37189).
. K Patel, “The world according to Dirco (v. Jan 2013)”, Daily Maverick, January 25, 2013.
. W Bello, “U-20: Will the global economy resurface?”, Foreign Policy in Focus, March 31, 2009.
. D Harvey, “The G20, the financial crisis and neoliberalism”, Interview on Democracy Now!, New York, April 3, 2009.
. National Planning Commission, 2030, Our future – make it work: National Development Plan, Minister in the Office of the President, Pretoria, August 2012, Chapter 7.
. CityPress, “SADC banks on own development bank”, June 23, 2012, http://www.citypress.co.za/business/sadc-banks-on-own-development-bank-20120623/ and for more on the neo-colonial comparison, see T Ferrando, “Brics and land grabbing: Are South-South relationships any different?”, unpublished paper, Pretoria, http://ssrn.com/abstract=2174455.
. R.M. Marini, Subdesarrollo y Revolución, Mexico City, Siglo XXI Editores, 1974, pp. 1-25, translated at http://mrzine.monthlyreview.org/2010/bt280210p.html#_edn13 .
. O Bonfond, E Toussaint and M.T. Gonzales, “Will capitalism absorb the WSF?”, MRzine, February 28, 2010, http://mrzine.monthlyreview.org/2010/bt280210p.html#_edn13 .
. P Yeros and S Moyo, “Rethinking the theory of primitive accumulation”, paper presented to the 2nd IIPPE Conference, May 20−22, 2011, Istanbul, Turkey, p.19.
. Harvey, The New Imperialism, op cit; N Klein, Shock Doctrine, Toronto, Knopf Canada, 2007.
. The objective of a “brics-from-below” counter-summit in late March 2013, described at http://ccs.ukzn.ac.za and http://links.org.au/node/3260.